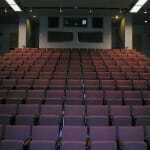 Located on the main-entrance level (second floor) of the Bloomberg Center, the Norman I. Schafler Auditorium features 320 cushioned seats, each with its own writing surface. The rows of seats are tiered and angled to provide more comfortable viewing. The audio-visual system features state-of-the-art presentation equipment, integrated so that the presenter/instructor has full control of the system from the multimedia lectern. The audio system was upgraded in 2008 by Visual Sound, Inc. 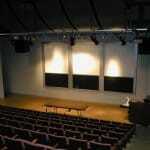 The auditorium is among JHU’s “general pool” of classrooms, under the control of Homewood Scheduling. To reserve the auditorium, contact the Office of the Registrar. Upon reserving this room, please be advised, you get the room only. Therefore, if audio-visual equipment, special setup, or use of the adjacent lobby is required, please contact Brian Schriver. Norman I. Schafler was born in 1917 and he resided in New York and Westport, Connecticut, until his death in 1986. He attended the Pratt Institute and served in the Army Corps of Engineers in Europe during World War II. He founded Condec Corporation in 1942 and built it into a leading manufacturer of robotics, defense, aerospace, and industrial equipment. The Unimation Robotics subsidiary pioneered the development and introduction of industrial robots into the workplace. In 1984, Mr. Schafler sold his interest in the firm and helped form Cortec Group, Inc., a private investment company with controlling positions in diversified industrial companies. At the time of his death, Mr. Schafler was a director of Sun Chemical Corporation, United Aircraft Products, and the Fidelity Trust Company. In 1982 he was appointed to the High Technology Advisory Board of the New York State Urban Development Corporation. A Trustee of Pratt Institute, Mr. Schafler received its Alumni Medal for Distinguished Service. He was an Incorporator of Stamford Hospital in Connecticut and the Institute of Living in Hartford, Connecticut, received an honorary Doctor of Laws degree from Sacred Heart University in Fairfield, Connecticut, and was president and chairman of the Congregation Rodeph Sholom in New York City. A founding member of the Young Presidents Organization, Mr. Schafler later joined the World Business Council and the Chief Executives Organization.